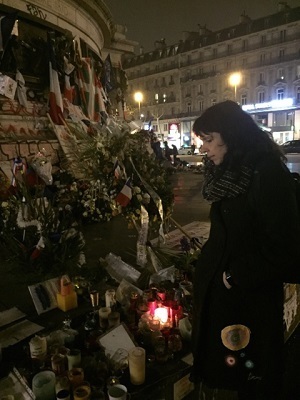 Birgitta Jonsdottir, the Icelandic Pirate Party Parliamentarian, shares her impressions about her visit to France during the climate negotiations. The 21st COP meeting was different from all the others. There was lots of talk about bottom up approaches and to some degree it rang true. It is however interesting to note that it is rare that parliamentarians/parliaments set the course in the negotiations; it is most often the ministers and when they leave, it is up to the chief negotiators to finish the job. So the voice of the general public is not really part of this process, let alone their representatives. The very platform and people that need to figure out how to implement and shape into law should be the lawmakers, the people who represent the general public, but the invisible army of the executive branch has been left to do this on their own, in a bureaucratic language and process that doesn't really make any sense to the rest of us. There have been 20 COP meetings with agreements that have to a large degree totally failed, maybe the reason for that is because it has all been done in a bubble. The failure is felt all over the world as the consequences of climate change has been felt with death, starvation and destruction towards all living beings in many parts of the world. I was amazed when I realised that in this COP deal that many say is the most important in human history fundamental elements and knowledge is ignored; not one word about cutting down meat consumption, not one word about the third pole melting in the Himalaya's, not one word about tar-sands and fracking nor plastic. We will not reach necessary changes if we leave this out of the goals. Cutting oil and coal is important but at the same time it is not the only aspect nor the most important because people have been helped into awareness in many key places on how to change lifestyles in order to curb it in many parts of the world. The big mega corporations will not be held accountable and the carbon trading quota system is devious and it needs to be stopped because it will not yield in the long run anything but corruption. My last day in Paris I finally managed to speak to one of the activists under house arrest. His story left me with profound worry about where we are heading in Europe and beyond. It seems like in France the authorities are using the emergency laws to put random people under house arrest, without court order. Around 30 activists are under this type of arrest without due process until the end of COP21 or longer. Seriously flawed Minority report and Orwellian tactics. I did say during a very brief speech at the IPU meeting in France’s Parliament that I was frankly disgusted by these house-arrests and condemned the French authorities for claiming to be withholding to the highest esteem human rights while they are stripping freedom of expression and association away. This activist told me that he had spent the time under house-arrest to compare the news today to the news prior to the Second World War and the similarities are striking. I urge you to see the documentary Fascism INC in order to get a deeper understanding about the powers at play. We will not be able to stop the environmental disasters that are already happening unless we find a way to tackle the one tiny nation of the wealthiest on this planet. They are transnational, untouchable power that is unlike extreme weather something we should be able to get under control. For a few weeks the world’s media and peoples focused on climate change. 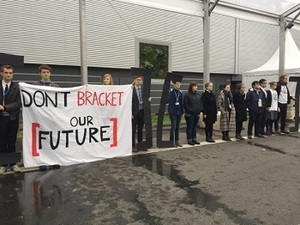 The spirit of COP21 was ground up. That there was need to get the peoples of the world involved and that parliamentarians needed to be part of the process of shaping policy and goals of the future. Climate Change committees such as in Britain might be a way forward. After a week in Paris at various meetings and events with the focus on COP21, I am more certain than ever that it will be up to us, the peoples of the world, to transform our relationship with stuff and to learn to embrace the fact we are part of the earth, and start to behave and make choices for the next seven generations. There will be no short cuts and we can’t allow ourselves to cop out. These transformations are not to be afraid of, life is all about change, the spirit and creativity of those outside the main debates give me hope that we will be able to weave connections and new solutions that indeed can and will be pretty amazing. 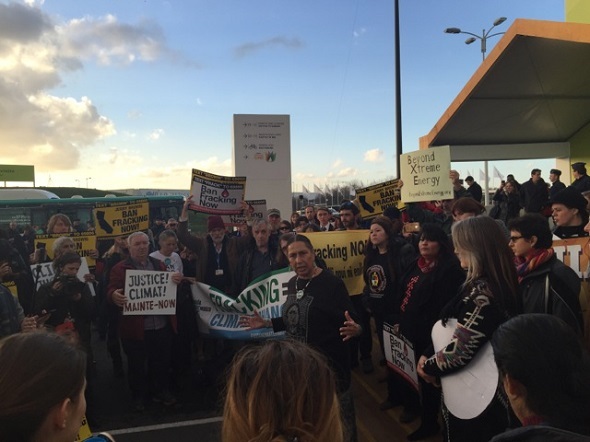 My highlight from Paris was to stumble into an anti-fracking action on my way to the bus with the amazing Casey Camp-Horinek speaking in such a way that I was moved into tears. All of a sudden I was in a circle chanting and dancing with strangers that felt as real as my family, then it was all over and my heart was full of joy and hope, no matter if the 1.5 or 2 will be decided. Thank you all fellow earthlings who have been part of COP21 all over the world. We are only starting. The creativity and compassion that can be found within so many will be our salvation. Now the great task of co-creating a joint vision for our future is our next big task. Birgitta Jonsdottir is a poetician, activist & a member of the Icelandic Parliament for the Pirate Party, Chairperson of the International Modern Media Institution.